You've reached the home page for the German American Partnership Program for Temecula Valley High School! 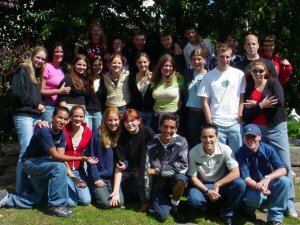 GAPP 2002 with the Jakob-Ellrod Schule and Temecula Valley High School has now CONCLUDED! 13 teenagers from Temecula Valley High school have safely arrived back in Temecula, California and are getting back to their normal lives. This site will remain up indefinitely as a service to all those who were involved. A heart-felt thanks to all the American parents who were so supportive and helpful. It was one of the most successful exchanges we've ever had! You may view the exchange in pictures by clicking on the "daily images" link on this page above. The whole GAPP 2002 gang!